Aquatic invasive species are perceived to be one of the most important environmental issues concerning boaters (Beardmore 2014). EWM has many characteristics that contribute to its tendency to become a nuisance and is considered one of the most problematic submerged aquatic plant species in North America(Smith 1990). The primary issue with EWM is the amount of biomass the plant will produce, not necessarily its presence?not all populations of EWM will become major infestations (Grace 1978). When EWM is moved to a suitable habitat, it has the propensity to accumulate biomass quickly and expand in population size rapidly. There are reported instances of EWM canopies growing dense enough to support the weight of frogs and wading birds (Aiken et al. 1979). Its anatomical and physiological features, such as its similarity to C4 plants and a low photosynthetic compensation point,? low N and P requirements, and high sexual and asexual reproductive capacity all contribute to its success (Grace 1978). Although EWM prefers warmer water temperatures, it is able to tolerate and photosynthesize in low temperatures. 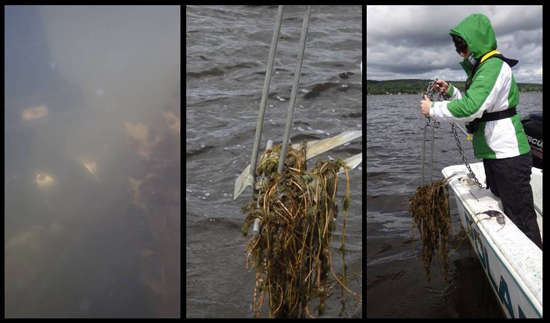 Cold tolerance allows it to grow earlier in the season and out-compete other macrophytes for space and subsequently light once a canopy is formed. Its ability to form dense canopies makes it an excellent competitor for light. It has a wide tolerance range for many environmental attributes, so it can colonize a variety of habitats. It is able to colonize previously unvegetated habitats (Keast 1984), and fragments from nearby populations can quickly establish and grow in habitats where native macrophytes are disturbed or removed by ice scour, sedimentation, bioturbation, herbivory, and water level changes(Smith 1990). Once established, it is able to persist through disturbances. 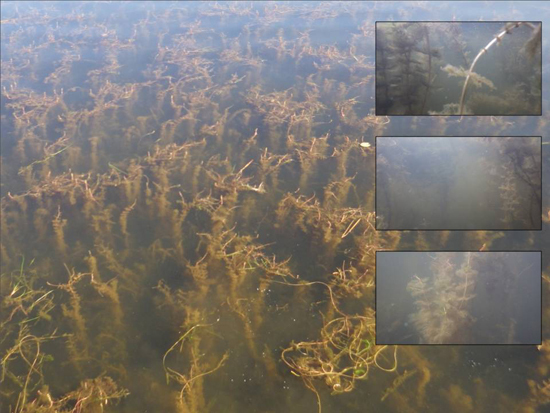 In addition to its low nutrient requirements, EWM is able to take up nutrients from the sediment via its roots, it is able to tolerate and grow well in areas where there are low concentrations of nutrients in the water column when other macrophytes are starved of nutrients(Smith 1990). It is also able to grow well in drought years when there is little nutrient input into waterbodies from run-off from the surrounding watershed. Indoor laboratory studies suggest that EWM fragments are able to remain viable for a short period of time (< 3 hours) out of water (Jerde et al. 2012, Barnes et al. 2013). Although longer fragments have a higher probability of survival (Mcalarnen et al. 2012), fragments less than 5cm are still able to grow after an hour of exposure to air (Jerde et al. 2012). When experiments were conducted outdoors, EWM fragment strands were able to survive and grow after 18 hours of air exposure and coiled fragments survived between 48 and 72 hours of air exposure (Bruckerhoff et al. 2014). These results suggest that EWM has the capability to survive out of a waterbody and can be easily transported within and between waterbodies by recreational boaters. Invasion by non-native species has many ecological and economic ramifications. They alter ecological communities, can reduce the services provided by ecosystems (forest products, fisheries, agricultural systems), and impact recreational activities (Horsch and Lewis 2009). There are some ecological benefits to having EWM in a water body?for example, EWM is a low-grade food for waterfowl (Elser 1967, Nichols 1975), produces oxygen, filters nutrients, can stabilize the substrate, and in low densities may provide shelter and food for some invertebrates and fish (Keast 1984, Engel 1987); however, dense populations of EWM often lead to major ecological impacts and have ramifications toward native habitats and native organisms. EWM can disrupt food-webs in both estuarine and freshwater waterbodies, however, the impact isn?t as prevalent in the estuarine systems (Duffy and Baltz 1998, Martin and Valentine 2011, Martin and Valentine 2014). Invasive species are an important threat to biological diversity, second only to habitat losses (Wilcove et al. 1998). EWM has been shown to displace native species in a span of 2 to 3 years. For example, EWM replaced eelgrass in Lake Mendota, WI (Lind and Cottam 1969), Elodea in Deviled Lake, WI (Lillie and Budd 1992), and many populations of native macrophytes in Lake Wingra, near Madison, WI (Nichols and Mori 1971). Like many aquatic invasive species, EWM can alter the chemical and physical properties of water when it grows in dense stands. Decomposition of EWM has been shown to accelerate eutrophication by releasing nutrients, especially phosphorous that was translocated from the sediment into plant tissue during growth, into the water column (Carpenter 1980). Since EWM self-prunes its leaves and also dies back in the fall, large populations of EWM result in the buildup of biomass on the sediment. Decomposition of EWM biomass and the increased respiration rates of microbes will lead to lower dissolved oxygen levels in the water column (Grace 1978, Bates 1985). Invasive plants that form dense stands, such as EWM, can reduce mixing; therefore, the atmospheric oxygen dissolved in the water-atmosphere interface are not diffused throughout the water column (Fleming and Dibble 2015).? EWM?s restriction on flow and mixing of the water column can also result in an alteration of the temperature profile of by up to 10?C per meter (Dale and Gillespie 1977, Aiken et al. 1979) further reducing dissolved oxygen. 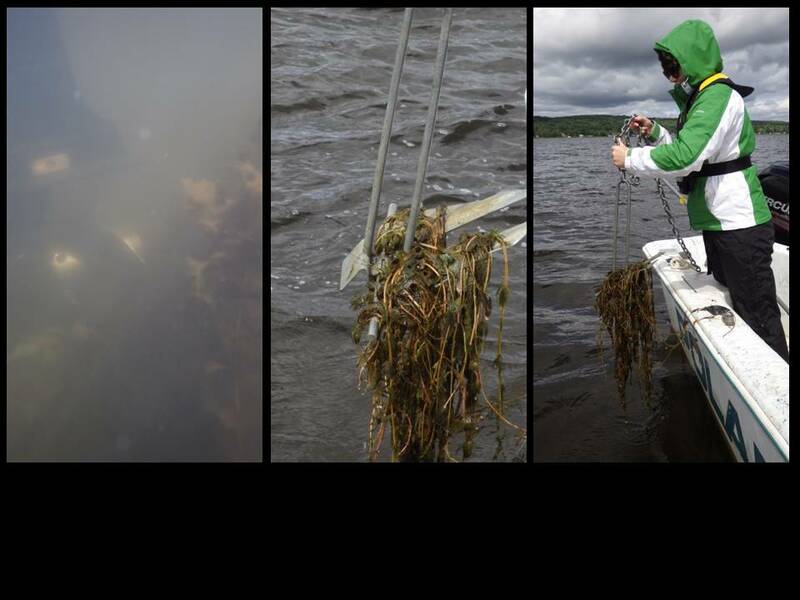 EWM can form dense canopies, especially in turbid waters, that will block the light from reaching the substrate restricting the growth of macrophytes underneath it(Madsen et al. 1991). EWM grows early and elongates rapidly, thus giving it a competitive advantage for light over native plants, including the native northern watermilfoil(Valley and Newman 1998). In shallow clearer water, where light is not limiting, EWM may be at a competitive disadvantage when growing with established native plants (Abernethy et al. 1996, Valley and Newman 1998), particularly if the native plant density is high (Agami and Waisel 2002). EWM can have major implications on aquatic food webs (Toetz 1997). There are only a few species of Lepidopterans and Coleopterans that feed directly on EWM (Newman 1991), so EWM?s primary contribution to the food web is through decomposing material in the detritus. In some cases EWM may not contribute to the diet of animals at all (Toetz 1997); however, in other cases, EWM has been shown to contribute partially to the food web. In the latter cases, EWM presence resulted in the uncoupling of the carbon flow to secondary consumers (Kovalenko and Dibble 2014). EWM is allelopathic (Gross et al. 1996, Nakai et al. 1999, Nakai 2000, Glomski et al. 2002, Korner and Nicklisch 2002); therefore, the presence of released allelopathic compounds by EWM could directly affect the algal and periphyton community, thus reducing productivity (Ervin and Wetzel 2003). The allelopathic compounds contained within senesced EWM also reduces the quality of detritus (Ervin and Wetzel 2003). The changes in microbial communities and the quality of detritus then affects the invertebrate community. 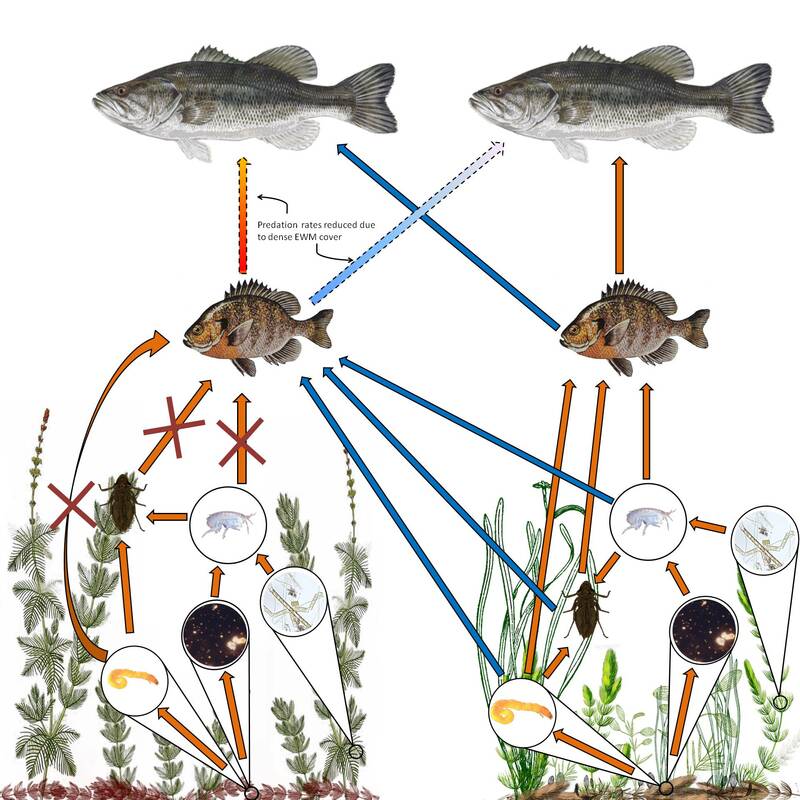 EWM and the epiphyton that grows on it do not contribute much energy or nutrients to higher trophic levels?fish prefer prey that originates from native plant communities (Kovalenko and Dibble 2014). Even fish that use EWM stands for harborage have been shown to get their energy and nutrients from native plant communities (Kovalenko and Dibble 2014). On the other hand, predatory invertebrates, such as dragon- and damselflies, can gain up to approximately 80% of their nutrients and energy from EWM; however, these insects are contributing to fish diets (Kovalenko and Dibble 2014). In EWM invaded ponds, higher trophic levels rely on native plant communities for food (Figure 7). Dense stands of EWM also influence the predation rates of piscivorous fish. Largemouth bass, for example have difficulty entering and foraging for prey in dense EWM stands(Engel 1987), which can result in an increase of bluegill and a decrease in bass. EWM is a low quality food source, so although it may be edible, it is not preferred by waterfowl. Dense populations of EWM will displace desirable vegetation species, leading to low-quality habitat for waterfowl (Elser 1967). Dense stands will also alter the distribution of invertebrates and fish (Frodge et al. 1990, Boylen et al. 1999). In the mid 1900s, EWM was planted in ponds to improve fish habitat and in mild infestations, EWM has been shown to benefit invertebrates and fish. It serves as substrate on which food can grow and it also serves as refuge for small, foraging fish (Pardue and Webb 1985, Killgore et al. 1989, Chaplin and Valentine 2009, Valinoti et al. 2011). On the other hand, dense vegetation will reduce predation success of larger predator fish, such as largemouth bass, leading to a reduction in the populations of these fish (Engel 1987). EWM will also reduce spawning success by covering the spawning grounds (Newroth 1985.). Dense infestations will alter the hydrology of the waterbody slowing currents and wave action. The standing water then provides habitat for mosquitoes (Bates 1985) and Schostosomatidae parasites that cause swimmers itch (cercarial dermatitis) (Jacobs 2009). The reduction in dissolved oxygen in the water column through decreases in mixing and increased decomposition can also displace fish and other animals (Madsen et al. 1991, Madsen 2005, Fleming and Dibble 2015). Invasive species are estimated to cost $1.4 trillion globally (Pimentel et al. 2001). In the United States, management and production losses associated with invasive species cost $120 billion annually (Pimentel et al. 2005). One estimate suggests that aquatic invasive species can result in $14.2 billion in damage, losses, and management efforts (Pimentel 2005). Aquatic weed management using 2,4-D alone can cost $17 million nationally and result in up to $10 billion in direct and indirect economic impacts (Rockwell 2003, Lovell et al. 2006). Aquatic invasive species in the Great Lakes region alone is estimated to cost over $100 million per year (Rosaen et al. 2012). In 1999, the State of Michigan appropriated $4.2 million toward invasive species, of which $3.4 million went toward control efforts (GAO 2000). EWM is estimated to cost $400 million per year in the United States for control and damages (Pimentel 2005). This suggests that the average cost of EWM control per hectare is approximately $2,000 (Pimentel 2005). Costs associated with aquatic invasive species include direct operational costs such as herbicide purchases, labor to apply or physically remove the plants, impacts on industrial facilities and water treatment operations, and reduced local incomes due to decreases in tourism. Waterways may become impassible to ships, and ships become fouled, which in turn can impact transport speeds and increases clean-up costs. Indirect costs may include increased food prices due to low fish production or fouled fishing equipment and impacted operations and reduced tourism and recreation(Rosaen et al. 2012). The presence of EWM has been shown to have a major impact on land values (Horsch and Lewis 2009, Zhang and Boyle 2010, Rosaen et al. 2012). According to data collected in Wisconsin, property owners are willing to pay an average of approximately $30,000 more for a property on an EWM-free lake, and EWM presence decreases property value (land and structures) an average of 8% and land value by 13%(Horsch and Lewis 2009). Home owners in the Pacific Northwest are willing to pay much larger sums, over $94,000, to live on EWM-free lakes corresponding in a 19% decrease in property values (Olden and Tamayo 2014). A model produced by Zhang and Boyle (2010) suggests that property values decrease exponentially as EWM coverage increases in a lake. If EWM increases in areal coverage, for example, from approximately 50?10% to 70?10%, there is a 6.4% decrease in property value. The reduction in property values may also directly result in reductions in property tax, thus providing less revenue for local governments (Olden and Tamayo 2014). According to a survey conducted in 2011, Wisconsin land owners are willing to pay ~$570 annually for a program to prevent EWM from invading lakes. This is much less than the estimated welfare loss of $1800 per year per shoreline property or the capital loss of between $20,000 and $35,000 once EWM has invaded (Provencher et al. 2012); therefore, proactive prevention of EWM from entering lakes in a measure that must be taken.